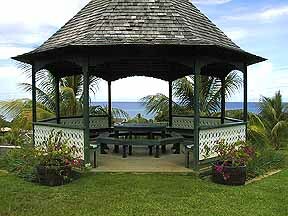 The gazebo provides panoramic views of the estate and coastline. On the South side of the estate, there is a beautiful park with a large gazebo perched on a small hill. The view is spectacular. Coconut trees all around sway in the breezes coming up from the sea. This is a great place to take a picnic or to watch the sunset. And if you are visiting with children, it's another place to take them to play. 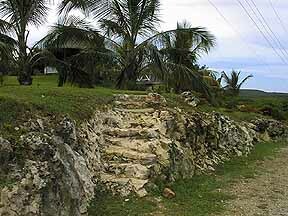 Access to the park has been made by cutting out steps in the rocks. The entrance steps have been cut into the rocks.